A Beauty Professional's Point of view. Have you considered the reasons to hire a makeup artist or hair stylist for your wedding day? While there are many reasons to hire a makeup artist AND hair stylists for your wedding, they are all rooted in looking your best on your special day. Your wedding will be forever remembered through wedding photographs and the hiring of professional artists will help ensure that you are flawless and beautiful the day of and in the lasting memories of the event. Furthermore, the benefits of a Beauty Agency vs. freelance artists are numerous. Considering the financial commitment and high expectations, the "beauty" of not worrying about the last minute proverbial bus - sickness, criminal backgrounds, poor character, or other hurdles - is a benefit that only reputable agencies can provide. Read our top 10 reasons why you need a professionally vetted makeup school graduate and hair stylist on your wedding day. Of all the reasons to hire a professional makeup artist and hair stylist for your wedding day, this may be the single most important benefit. Take it from experienced brides... your wedding day is guaranteed to be busy and will likely include a few unexpected challenges, so don’t let your appearance be one of them. You shouldn’t have to spend time worrying if your eyeliner is straight while ensuring that your vendors deliver on time. Any reputable artist that is a professional will meet with you prior to your wedding day to do a trial run of the makeup look or hairstyle you want. On the day-of, your beauty team rolls in, on location, and knows your skin type, your desired outcome, your theme, and any complications in the trial. See how your booking process looks with WarPaint International Beauty Agency. The Bride Experience. Your booking process with WarPaint International Beauty Agency. 2. You want to look "natural"
Professional makeup artists study the art of their craft. They live it and breathe it like a musician, and the proper selection of colors is part of their DNA. From your foundation to your lips to the perfect eyeliner, makeup artists know how to choose the colors that match your unique character and features. Your wedding day will keep you photographed, possibly more than any day in your life. High definition optics can do some interesting things to your complexion and pores. Even if you tend to live in the "natural" state and your photographer does to, find a makeup artist that specializes in "natural" looks so that your memories and face-to-face interactions are striking and memorable. The natural look is far more involved than most brides think. In fact, what most people categorize as difficult is the avant-garde, high-fashion looks you see all over the internet. If this were the case, more Instagram makeup artists would be showcasing breathtaking, natural looking brides than stamping out glorified brows and winged eyeliner. Like it or not, there is a big difference behind mainstream, less expensive makeup and hair products vs. professional grade products that have been engineered for specific applications. Since makeup artists apply cosmetics for a living and hair stylists test the quality of hair products every single day, most have a kit stocked with high quality (and possibly very expensive) products that are designed for wearability and flexibility that you may not own or be able to afford. Not to mention, most artists endure years of professional training to keep up with the trends, techniques, and industry concerns. You simply can't put a price on their experience or the luxury and intimacy of having them apply it and perfect it. It is after all, what they live for - your beauty. Don't fool yourself. You likely don't have the experience mentioned in point number 3, and even if you do why in the world would you want to exercise it on your own wedding day? Experienced makeup artists practice the art of makeup every single day. Experienced hair stylists nearly double that rate. Professional makeup artists and hair stylists have painted hundreds, if not thousands, of faces and designed hair in dozens of eras, themes, and personal taste categories. If you’re not a makeup artist or hair stylist and you haven’t studied the proper methods of executing flawless looks that withstand heat, wind, tears and very long days, then pass on the notion that you'll save a few dollars. The key to being a perfect bride is to be yourself; that usually still requires professionals to extract that state and keep it there for your wedding day. On a more important note, most brides envision their day beginning in an artist's chair with champagne in hand and the loving banter of their bridal party - not a stress-filled morning of racing the clock and no human interaction. It's not that you don't already wake up looking breathtaking... We actually wouldn't change a thing about you. Industry professionals study tricks to emphasize a person’s best facial features while disguising other, less flattering ones just by applying makeup. Hair stylists have an in-depth knowledge of hair types and tendencies, scalp problems, and product benefits. If you want to really highlight your eyes for your big day, your makeup artist can use special makeup techniques to make that happen without caking on the product. Want to pull off a bold lip color, but are afraid of transferring it onto your groom when its time to “kiss the bride”? A professional makeup artist can help prevent that, too. Scared of your hair flying away or falling due to heat? Yeah.. they've got that covered. This is one of the most important pieces since the bulk of your day will be spent saying "CHEESE". Experienced makeup artists and hair stylists will sculpt your look using contouring techniques to add the illusion of depth in 2-dimensional photographs and in real life. You instantly turn into a 2-dimensional image instead of a 3-dimensional being when your photo is taken. If you choose to not use a makeup artist or hair stylist, you're likely to be a flat image in your captured memories. If you use a makeup artist that is not experienced, or your makeup and hair are applied and styled improperly, you'll also appear flat and in some bad cases that we've seen - orange! Lastly, you don't want to appear shiny, gray, over, or underdone. Perfection is the key. You are perfect, right? It is amazing how many women will visually match their friends for Halloween, themed parties, even "pajama parties" but when it comes to their wedding day - the one day everyone should look the same - they turn the other cheek. Think about the last wedding you attended (or even stood for) that had no beauty or dress direction, no orchestration, and no attention to detail. Though that may be the personality of the wedded couple, it certainly spells frustration for their guests and mixed feelings about their captured memories. If cost is a factor, skip the bachelorette party and treat your ladies to luxurious beauty. Nothing is more memorable than sitting back together in a bridal suite, sipping champagne, laughing and letting the professionals unfold your beauty desires. Stress-free is the key and your entrance and impact to your guests will be memorable. We said it above, but its a pain point for many. We've met brides that have paid in full for 3 or more trials and come to realize they were dealing with an amateur, or their sister's friend or aunt (who can do it for them) and walked away only spending more money on the right fit. Demand a trial. No makeup artist or hair stylist can walk into your wedding day and smash it out of the park. This relationship is an intimate one and takes discovery questions and a few dry runs in some cases. Always, always have a makeup and hair trial. You'd hate to be orange from the chin up on your wedding day, or worse yet... your artist leaves for Vegas instead. Hire a Beauty Agency. Yes there are talented, dedicated freelance individuals all of whom deliver endlessly, but they do get sick, have car accidents, run late, endure family deaths, etc, etc. When hiring a beauty agency, your selection of top professionals is much broader, but the security of not having a mishap with an artist on your wedding day is alleviated. Even if your artist gets hit by the proverbial bus, their trial notes and opinions are available to the agency and an artist that matches their skill-sets and schedule will simply step in to ensure a flawless wedding day for you as if nothing ever happened. At WarPaint International, we screen our artists, do technical interviews to test their skill level and work with a wide array of schedules. Criminal background checks. We are also a national partner to Trusted Employees, so we criminally background check our Artisans across state and federal databases for background information. We have passed on applicants that work for our competitors or on their own. You wouldn't want a convicted felon in your home, hotel room or personal space scoping out their options. Be smart when hiring on-site professionals. You may also find benefit in pre-wedding day skin care tips to ensure smooth delivery and a "day of" itinerary for your wedding party to follow and depend on. No one should have to ask "when is Jenny's hair getting done" or "when does this person arrive". We've got that covered. Project management comes at no extra cost and ensures that you look beautiful and we provide superior expertise and service on the most memorable day of your life. SO... Will you be hiring a professional to do your makeup and/or hair on your wedding day? You won't regret it and though we recommend shopping around to find the perfect match for you and your bridal party, if you're looking for excellence in hair and makeup artistry with the added benefit of a wedding planner for your beauty needs, seek a beauty agency. WarPaint International. 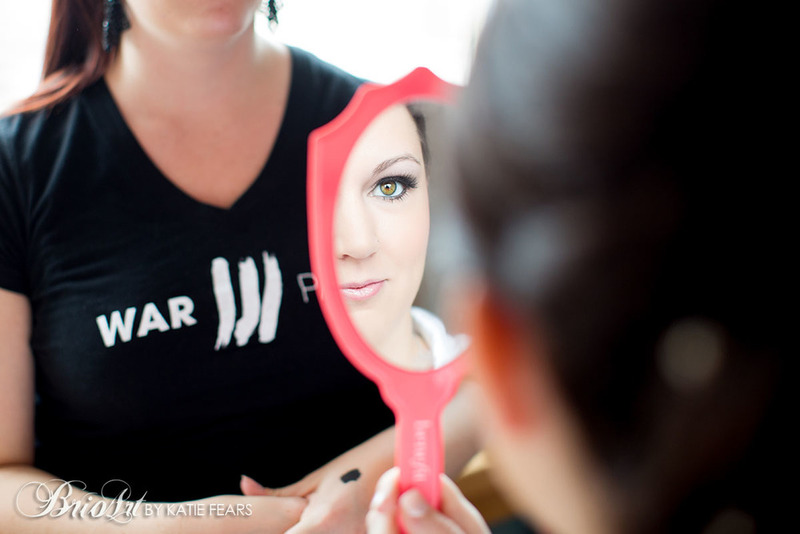 See how your wedding day will look with WarPaint International Beauty Agency. The Bride Experience. Your wedding day with WarPaint International Beauty Agency. Want to chat with us about your wedding day beauty services? Check out our weddings page and contact us to set up a time speak with a WPI bridal consultant about the details of your big day!